Nowadays, it is common practice to utilize fixed income instruments to hedge against the unpredictable equity market. Yet fixed income instruments have their own interest rate risk that requires hedging as well. Imagine’s interactive interest rate hedging tool, the IR Hedging Matrix, enables users to evaluate interest rate risks associated with any portfolio, book, or ledger, and returns the number of hedge contracts needed to hedge the interest rate risk. Interest rate exposure and hedging contracts can be seen across all yield curves associated with a holding’s pricing environment. In the illustration below, we choose the Risk Curve “AUD-GOVT” and then right click Load Risks => Default, as below. The first row displays the Dv01 of the entire portfolio and the corresponding number of contracts needed to make the portfolio Dv01-neutral (for the respective Risk Curve). The second column, dHtot(R), is the risk exposure per instrument that makes up the yield curve. Since AU5YT=RR is the main contributor to the yield risk (-569.11 out of -687.17), by shorting 1.41 units of the AU5YT=RR bond contract, the portfolio manager can hedge the majority of the portfolio’s AUD-GOVT Dv01 risk. The fact that the Dv01 risk primarily comes from AU5YT=RR is intuitively in line with the maturity of the treasury bond being analyzed: AUGV 2.25% 11/22. However, considering that it’s not conventional to sell 1.41 units of the said hedging instrument, the user can override the optimal hedging units, initially calculated from the Recalc Hedge option, by directly keying in the intended hedging units in the first row for each instrument. 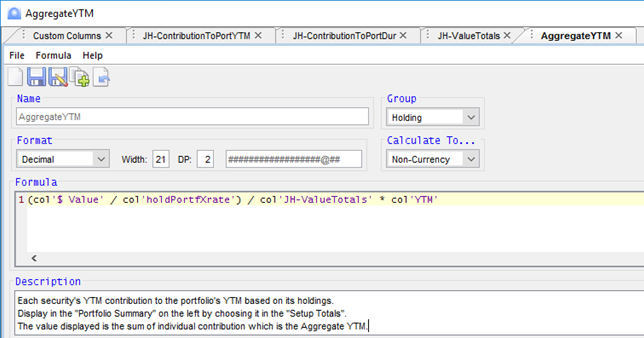 In the example below, the unit of AU5YT=RR bond was changed to -1.00 and the hedging matrix automatically calculated the portfolio’s Dv01 risk being hedged as 522.00 (shown in dHtot(R)). The user can always return to optimal hedging scenario by right clicking and selecting Recalc Hedge. To complement the IR hedging tool, users are able to customize calculations based on Imagine’s Fixed Income sensitivity analytics (such as Duration, Mod Duration, Convexity, Mod Convexity). Below is an illustration of a custom column built for this purpose. 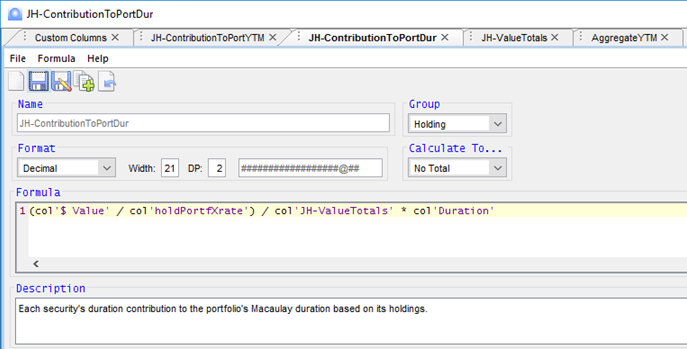 In the example below, we look at a portfolio’s aggregate yield/duration/convexity calculation along with the contribution of each holding to the whole portfolio. Jianyao (Janelle) He recently joined Imagine with varied internship experience in process automation and programming from well-known financial institutions. As a member of Imagine’s APAC Consulting team, Janelle is currently engaged in client customization projects. She is pursuing a BSc. degree in Quantitative Finance and Actuarial Mathematics from The Hong Kong University of Science and Technology. She can be reached by email.